Sales of physical books might be tanking, but Apple’s “Quick Reads” and Amazon’s “Singles” are providing a new source of readers and revenue for publishers. Try explaining an e-book to a Luddite. How would you describe it? Well, it’s a book–a novel, a biography, some textbook or tome in a digital form. That definition needs a rewrite, now. This week Apple introduced a collection of new short-form books, called Quick Reads, that are like short stories, long articles or packs of recipes, priced at just a fraction of the cost of what users pay for a full volume. Amazon introduced a similar concept back in January 2011 with Kindle Singles–essays, short stories and other quick reads priced from one to three dollars. Newer, short-form e-books–in Amazon parlance “Singles,” and in Apple parlance “Quick Reads”–are not based on breakthrough technology but a few simple business realizations: The number of pages in a book has no bearing on the price or profit to be made, and consumers are willing to buy literature by the meter or the mile. According to a company spokesperson, the Kindle store currently features 95 titles in its Singles collection including: “The Megabanks Mess” by former TARP administrator Herbert M. Allison ($.99), “Mile 81” by Stephen King ($2.99) and “Assange Agonistes” by journalist Heather Brooke ($1.99). The new, Apple Quick Reads collection launched with titles like: “Planet Killers” ($.99) about menacing asteroids by The New Yorker’s Tad Friend, “This American Burger” ($4.99) by former New York Times food writer Molly O’Neill, and “Excellence Now” ($5.99) by Tom Peters. In some ways, Apple’s official launch of Quick Reads is an expansion of what started several months ago with cookbooks and children’s volumes in their iBookstore. In July, Cookstr–a New York City startup that helps high-end cookbook publishers and culinary talents go digital– began to sell small recipe packs in sizes ranging from 10 recipes, selected by theme, like “Summer Starters” or “BBQ Menu,” for 99 cents, to all 250 recipes for about 10 bucks. 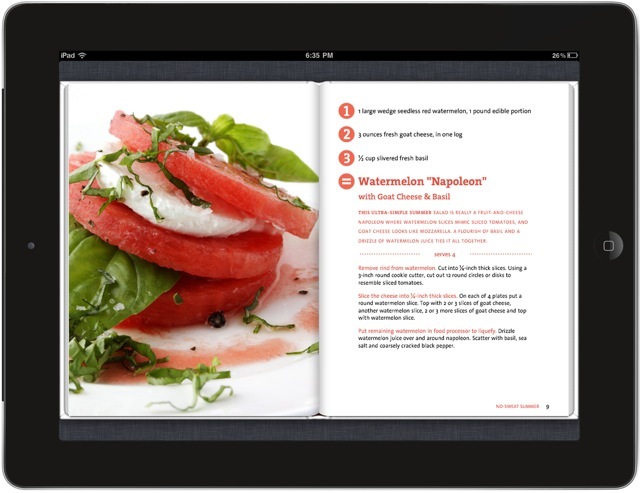 Cookstr started selling these short form iBooks with a collection from chef Rozanne Gold, the 1-2-3 Collection. Other recipe sets in the iTunes store include 99-cent cooking titles from Good Housekeeping. By opening a dedicated Quick Reads section, Apple is showing that short attention span theater, or more generously, high impact content for time-pressed consumers, isn’t just for television. Brevity, they’re betting, will appeal to the literate, too. The growth of mini-books and special sections featuring content like Cookstr’s recipe packs, raises another question: Will publishing be revitalized or cannibalized by the opportunity to sell sections or even chapters of books? The excerpt-seling model makes less sense, naturally, for novels or non-fiction where the content is composed of a sustained narrative. A VP at digital bookseller Kobo, Michael Tamblyn said, “[This] just isn’t how people want to pay for a book. A work of fiction or narrative non-fiction is truly more valuable than the sum of its parts.” Before changing its name to Kobo, Tamblyn’s company was called Shortcovers. It specialized in selling short titles and parts of books, a focus the company abandoned in 2009. To draw an analogy to the music industry–going from albums (books) to singles (chapters) could makes great sense and lead to better business for some types of authors (artists) and publishers (labels). Who would benefit most? Lone Pine Publishing is developing what they informally call “chunkable” books about everything from nature and gardening to self-help and, of course, cooking. Selling books by the passage also represents a real revenue-increasing possibility for textbook publishers. College professors have long combined excerpts from various books into class readers, those photocopied, Kinko’s-bound volumes they hand out at the beginning of the semester. For many years, companies have tried to get academics to do the same thing in digital form–while protecting copyrights–with desktop apps or password-protected website collections. That way never caught on, says said Liza Daly, owner of a strategy and design agency that helps publishers, Threepress Consulting. She has hope for the excerpt market given the popularity of the iPad, Kindle, and other e-book readers, especially on campuses despite those earlier non-starter attempts. She also points out that an industry of rights-management companies, like Vitalsource and others, are now poised to work with various publishers to settle on fees and permissions, and get “chunks” of text into readers’ e-books, while helping authors and publishers get fairly paid.